TT wrestlers Keron Bourne, right, and Minie Mayers, left, are congratulated by TT Wrestling Federation boss Jason Fraser, after winning medals at the Bridgetown Burning Championships recently. 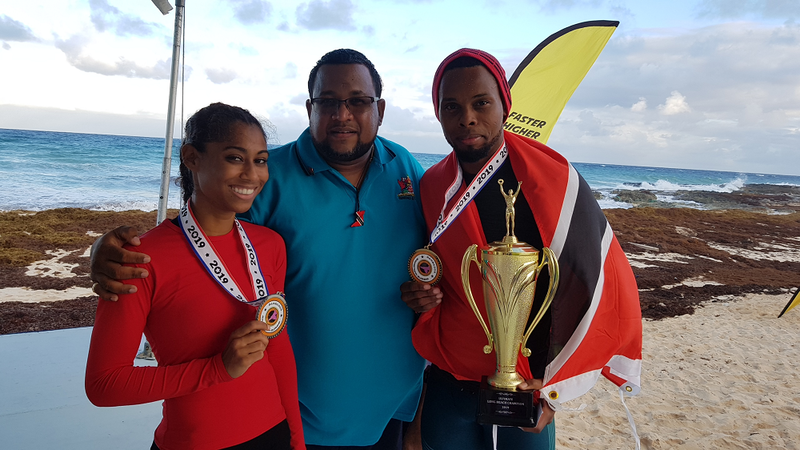 TT’s wrestler Keron Bourne got the better of Barbadian Koi Hoyte last weekend, in the Champion of Champions Grand Slam final, at the 20th Bridgetown Burning Championship in Barbados. Bourne, the champion of the 75-kilogramme-and-over category, needed only 35 seconds to defeat Hoyte, who was the champion of the heavyweight (95-kilogramme and over) division in the final. Bourne had earlier defeated top Barbadian Deshon Skeete to win the men’s 75kg-plus open weight class. Minie Mayers was the lone female representative for TT, and she earned silver in the women’s open weight class, after losing to Bermuda’s Krista Dyer in the final. Fraser congratulated Barbados sports ambassador Sir Rollins Alleyne for hosting the tournament. “It was an amazing weekend filled with combat sports and love,” he said. Among the countries participating at the event were TT, Bermuda, United States, St Vincent/Grenadines, Martinique, Cuba, Puerto Rico, Guyana, Jamaica and hosts Barbados. Reply to "TT wrestlers shine in Barbados"